Police outside a property in Birmingham, England, March 23, 2017, following an attack on Wednesday in London. Islamic State has claimed responsibility for Wednesday's attack near the British Parliament in London, which killed three people and ended when an officer shot dead the attacker. A statement posted on IS's news agency said the attacker was a "soldier of Islamic State." But IS did not indicate that it assisted in the planning or execution of the attack, saying the man had responded to the terror group's call to attack civilians and the military in countries allied with the U.S.-led coalition fighting IS. One police officer and an American tourist, Kurt Cochran from Utah, have been identified among those killed. The officer was killed on the premises when he was stabbed by the attacker. Cochran succumbed to his injuries in the hospital. His wife was also badly injured in the attack. Prime Minister Theresa May, in comments to Parliament about the attack, said the man responsible was born in Britain and was once investigated by the country's MI-5 intelligence agency "in relation to concerns about violent extremism." But she said he was not part of what she called the "current intelligence picture," and that there was no prior intelligence on this plot or his motives. She reiterated that the working assumption of investigators is that he was "inspired by Islamist ideology." British police have arrested eight people in connection with the attack. Mark Rowley, head of counterterrorism efforts for London's Metropolitan Police Service, said the arrests came from searches at six addresses, and that "inquiries" at locations in London, Birmingham and other parts of the country were continuing. He did not specify how those arrested were linked to Wednesday's attack. "It is still our belief, which continues to be born out by our investigation, that this attacker acted alone and was inspired by international terrorism," Rowley told reporters. He added that the attacker's name should not be made public during what he called a "sensitive stage" of the investigation. The probe right now is focusing on the motives, preparations and associates of the attacker, who ran a car into pedestrians on Westminster Bridge, then stabbed a security officer to death before himself being shot dead by another officer. Rowley said 29 people have been hospitalized, seven of whom were in critical condition. Rowley earlier identified the security officer who died in the attack as 48-year-old Keith Palmer, a husband and father who had served in British law enforcement for 15 years. 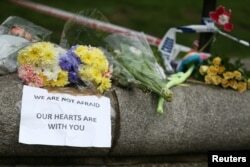 Flowers and messages are left near the scene of an attack by a man driving a car and weilding a knife left five people dead and dozens injured, in London, Britain, March 23, 2017. May's comments both Wednesday and her remarks to Parliament on Thursday have struck a defiant tone. As Parliament reopened for its normal meetings Thursday, May told lawmakers that what happened Wednesday "was an attack on free people everywhere." "Yesterday an act of terrorism tried to silence our democracy, but today we meet as normal, as generations have done before us and as future generations will continue to do, to deliver a simple message: We are not afraid and our resolve will never waver in the face of terrorism," she said. May thanked Britain's friends and allies around the world "who have made it clear that they stand with us at this time." She said the victims include nationals of France, Romania, South Korea, Germany, Poland, Ireland, China, Italy, Greece and the United States. The United Nations Security Council in New York, currently in meetings chaired by British foreign minister Boris Johnson, held a moment of silence Thursday for the victims of the attack. Thursday's Parliament session began with a minute of silence to remember those killed in the attack. Police officers also marked the occasion, standing silently outside the headquarters of London's Metropolitan Police nearby. London is under extra security with a boost in both armed and unarmed officers. A senior police officer told VOA it appears to have been "a three-staged attack." It began with an SUV being driven over Westminster Bridge right by the House of Commons. The SUV mounted the sidewalk and struck several pedestrians. According to police sources, the vehicle struck some other pedestrians at the perimeter fence near the gates at Old Palace Yard. “The attacker then rushed the gates and struggled with a police guard who tried to stop him. The assailant stabbed him several times," the senior police officer said. “Other officers shot the attacker." The gunfire was heard at 2:38 p.m. London time inside the House of Commons as lawmakers were debating legislation on pension reform. Eyewitnesses said about a half-dozen shots were fired. "It all happened within a minute," witness Tawhid Tanim told VOA. "I came out of where I work and saw a car had pulled up and I heard, I just heard bang bang bang and people running everywhere." In Washington, the White House said President Donald Trump spoke with Prime Minister May and was briefed on the situation in London. "We obviously condemn today’s attack in Westminster which the United Kingdom is treating as an act of terrorism, and we applaud the quick response that the British police and their first responders made to the situation," spokesman Sean Spicer said. The U.S. Department of Homeland Security said it is in close contact with British authorities, but that the U.S. domestic security posture remains unchanged. 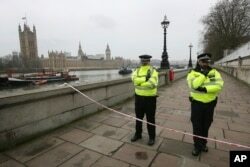 Police guard a cordon on the embankment with Britain's Houses of Parliament, left, in London, March 23, 2017, after attacks in London Wednesday. As the attack unfolded, May was in a voting lobby adjacent to the chamber of the House of Commons. Her plainclothes bodyguards drew their weapons and one officer put his arm around the prime minister as they quickly escorted her out of the House of Commons, according to Andrew Bridgen, a Conservative lawmaker. If confirmed as a terrorist attack, it would be the first in Britain since May 2013 when an off-duty British Army soldier, Lee Rigby, was hacked to death on a London street by a self-proclaimed jihadist. It is the worst attack at the House of Commons since the IRA bombing in 1979, when Conservative politician Airey Neave, a confidant of Margaret Thatcher, was killed.